I don’t know about you, but I was always a fan of mini snacks when I was younger. I think they are so cute- and, you usually get a bigger portion size for roughly the same amount of calories as the bigger counterpart! 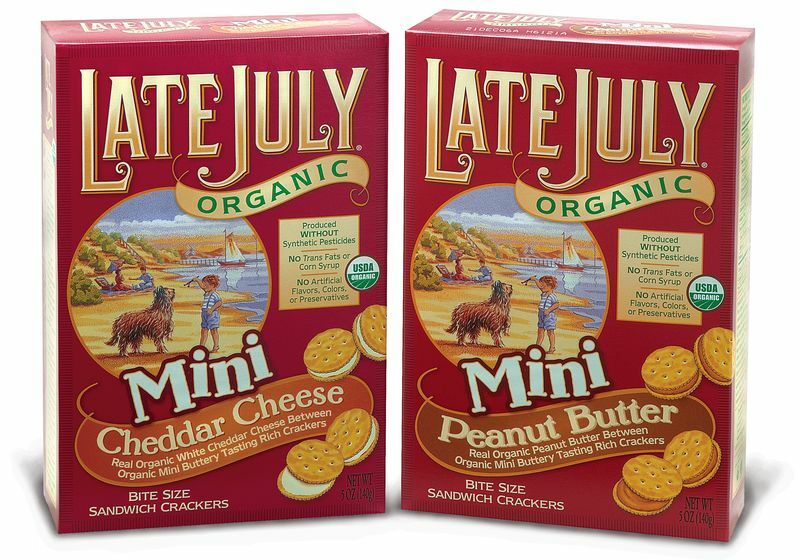 So, you can count on it that I was certainly happy when I got a box of each Mini Cheddar Cheese and Mini Peanut Butter Bite Sized Sandwich Crackers to try given to me from Late July! 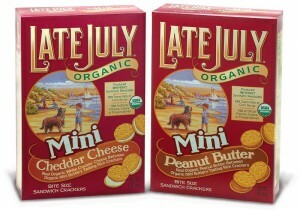 First, I tried the Mini Cheddar Cheese ones. I opened the box and saw a lot of little sandwich crackers- yum! I couldn’t agree more with the front of the box, as it said “Buttery Tasting Rich Crackers” for the cracker part, and “White Cheddar Cheese” for the cheese filling. It’s EXACTLY what it tasted like! The cracker was salty a buttery, a bit dry, and soft/flaky. The cheese had a nice white cheddar flavor, that was salty and slightly tangy. I liked that I got 13 crackers for one serving size, of only 110 calories! The Peanut Butter ones were just as good. The cracker tasted the same, salty, buttery and slightly dry, with a thick peanut butter on the inside. Thick in consistency, not amount. It had that stick-to-the-roof-of-my-mouth peanut butter, that wasn’t oily at all. It was also a slightly sweet peanut butter- yum! I do wish there was a bit more peanut butter on the inside, but still delicious! Overall, these get 4 stars. I love that I get 13 crackers (1 oz) for a serving size, that these are organic, and I loved twisting each cracker off one by one, and eating them that way. Brought me back to when I was little =) On the downside, there is hardly any fiber in these (less than 1 gram per serving), and they are a bit high in sodium (310 mg for cheddar cheese, 240 mg for peanut butter) and fat. But, I think they are a great snacking alternative, and are quite tasty, too! 13 crackers is 110 calories, 7-9 grams of fat, 16-18 grams of carbohydrates, less than 1 gram of fiber, 2-3 grams of sugar, and 2 grams of protein. Betty Lou’s Coconut Macadamia Ball. What is that, exactly? Well this product is a ball of goodness- protein, good flavor, all natural ingredients- the works! I also found out on the website, it is gluten free and soy free! 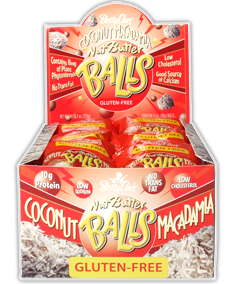 Betty Lou’s sent me some products to try, including this Coconut Macadamia Ball. At first when I saw it, I was a bit skeptical. It looked, well, small! 150 calories for a small ball? I hope it tastes good! Well, it actually was quite good. It’s COVERED in coconut, so if you like coconut, I think you’ll like this! It was a chewy, very dense, and sweet product. I tasted more coconut than macadamia nut, but it was still tasty either way. It sort of had a typical protein bar-ish taste to it, which I can’t really describe, but I’m guessing it’s from the whey protein in the ball. 1 ball is 150 calories, 7 grams of fat, 17 grams of carbohydrates, 8 grams of sugar, 5 grams of fiber, and 10 grams of protein. Why a backpack review on a healthy food and product review website? Well, walking is a great exercise for the body. However, while I LOVE a good tote/shoulder bag, lugging a whole bunch of books, snacks or whatever in one of those I find can really put a lot of stress on the body. I know whenever I load up too many things on my shoulder back, my neck, back and shoulder are not too comfy by the end of the day!! 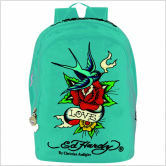 So, with the generous gift card I was provided by CSN, I purchased an Ed Hardy backpack. Upon opening it, I was in LOVE. Not only is the color one of my favorite colors (teal/aqua blue), it’s also one of my favorite Ed Hardy designs/characters- the bird with the rose! I also really liked that the rose was studded with pretty reddish jewels- it added a nice visual appeal. I opened up all the pockets and was very pleased. There is 2 zipper compartments, one large one with mostly empty space, and a smaller one that has a little compartment for things like a cell phone, or hair brush/makeup (which is what I did). I really liked the fact that there was a cushiony-gelpad thing going on on the back of backpack. Soft and comfy! The straps were really easy to adjust as well. There are two slots on the side of the bag where I put my water bottle, so I thought that was convenient as well. I think it goes without saying, this is my new favorite backpack! Comfortable, stylish, and perfect for me. I haven’t found a problem with it at all =) 5 stars! 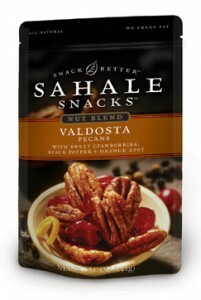 Sahale Snacks Review and GIVEAWAY!!! Oh it’s that time again- review and giveaway!!! “Valdosta and Sing Buri nut blends debuted at Seattle’s Best Coffee counters in convenient 2-ounce pouches — enough to share with a friend over coffee or to satisfy a morning and an afternoon snack craving. And.. as some extra celebration, a giveaway! 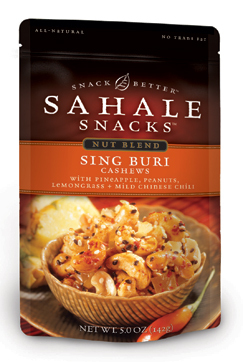 Of the Sing Buri and Valdosta Nut Blends. How to enter? Please leave a comment for EACH entry! 1. 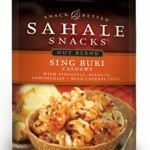 You must “like” Sahale Snacks on Facebook! 2. 2 ENTRIES! Link this giveaway to your blog/website, and leave a link in the comment section! 4. If you haven’t done so already, follow me/add me to your blog roll! There will be TWO winners, U.S. residence only. Giveaway will end October 1st 2010, 12pm. 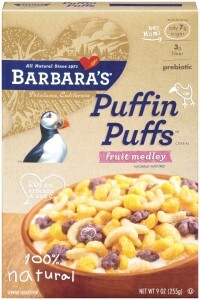 Ah, that cute puffin I have grown to love on most of the Barbara’s Bakery products. 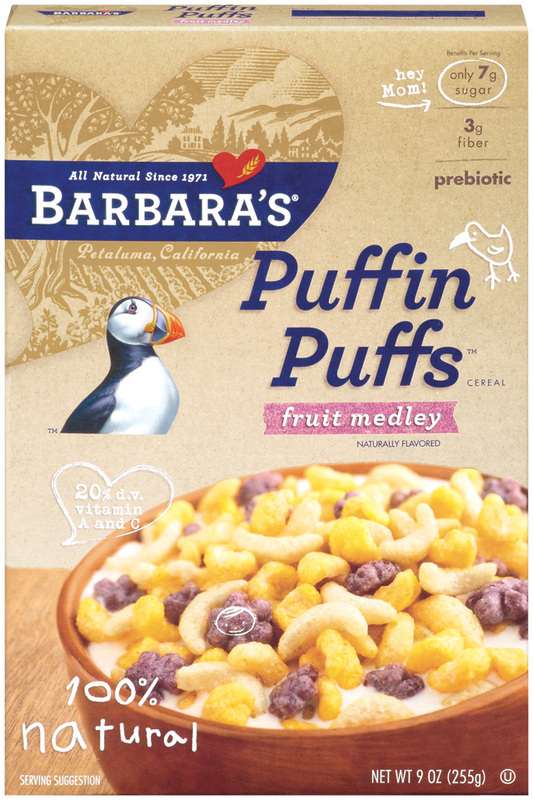 It’s almost as if when I’m browsing the grocery store, I don’t have to look hard to find the Barbara’s Bakery products- just look for the cute puffin! I opened up the single serve bag, and saw a variety of shapes and colors- certainly not what I’m used to with the familiar puffin squares. There were yellow banana shaped pieces, orange orange shaped pieces, and purple pieces that sort of resembled either a flower or a bunch of grapes, I wasn’t really sure. The taste sure was FRUITY! Almost a tropical feel really. Each piece sort of tasted the same, and all together, it reminded me of fruity-type cereals I have eaten in the past. The cereal was quite sweet overall, but not “sugary” tasting, which I liked. The texture was very airy, crispy and crunchy- even slightly sticky! Overall, an enjoyable cereal. I’m sure kids will enjoy this cereal, and I thought it was quite good too. I’m giving it 3 1/2 stars overall. It was a bit airy for my liking, and I can’t really see it satisfying my appetite for long. I do like how there is 3 grams of fiber, and only 7 grams of sugar per 30-gram bag! What’s your favorite childhood cereal? 1 bag (30 grams) is 120 calories, 1 gram of fat, 26 grams of carbohydrates, 3 grams of fiber, 7 grams of sugar and 2 grams of protein. Well, what about a granola with probiotics in it?? 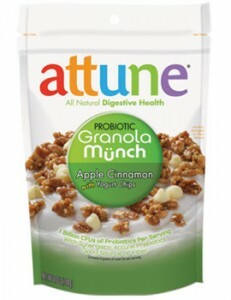 I was sent the Maple Nut Granola Munch from Attune ,and loved it. I was excited to try other flavors they had to offer, and well, I was sent the Apple Cinnamon flavor to try, too! Which is actually kind of funny, in my opinion. I actually went to the grocery store in the afternoon, and saw the Maple Nut and Apple Cinnamon flavor in the store. I was going to try the Apple Cinnamon variety, but realized I only had enough money to buy what I went to the store for. So, I figured I would buy it another time. Little did I know I would be getting a package only a few hours later of the Apple Cinnamon Probiotic Granola Munch! I opened it up almost immediately after I got it. There were crunchy and crispy pieces of granola, with tiny white pieces, that sort of resembled white chocolate chips. The taste was awesome, just as the Maple Nut flavor was. It was a great balance of well, apple and cinnamon flavors! A fresh, almost granny smith apple taste, with sweet cinnamon undertones. Although there weren’t a lot of yogurt chips, they were delicious. They had a buttery sweet vanilla taste, and were nice and smooth. I don’t know how Attune does it, but this granola is fantastic. The only downside to me is a serving is only 1 ounce, which is a bit small for a granola lover like myself. But I LOVE that this is all natural, has probiotics, and is TASTY! Oh, yea. You know what this means? It’s a 5 star rating! 1 serving (1 oz) is 120 calories, 4 grams of fat, 20 grams of carbohydrates, 3 grams of fiber, 6 grams of sugar and 2 grams of protein. So, alongside the DELICIOUS Peanut Butter Muscle Brownie I was sent from Lenny & Larry’s, they also gave me the Cookies & Cream Muscle Brownie. WHAT am I waiting for? Let’s give this a try NOW!! 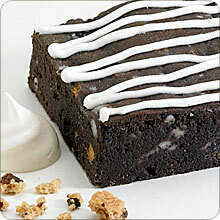 I opened up the package, and saw a dark brown colored brownie, with almost a white icing on top. It was kind of small, but thick and dense. It smelled very sweet, and had a vanilla aroma as well. So, how did it taste? I only have one word to describe it. As in, HOW is there protein in this deliciousness!?!? The brownie itself was soft and chewy, very slightly gritty, fudgy and sweet. The icing on top really wasn’t as sweet as I thought it would be, but was pretty good. There were also little bits in the cookie, which I thought were walnuts, but they were actually soft and sweet. So, I’m assuming they are not walnuts. I believe they were either “cookie bits” or “marshmallow flavored pieces” according to the ingredients. 1.41 Oz (40 grams) is 170 calories, 5 grams of fat, 20 grams of carbohydrates, 11 grams of sugar, 1 gram of fiber and 10 grams of protein. Well, there’s something I don’t hear every day. A Blueberry Muffin flavored bar! And an organic one, at that! 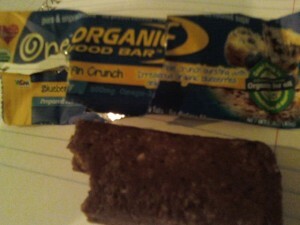 Organic Food Bar sent me some bars to try, including the Blueberry Muffin Crunch Bar. So, I may have gotten a little, “blueberry muffin crunch bar happy” before I took a picture, because I opened the package and took a bite before taking the actual picture. Whoops! Well anyway, here’s a pic of what I got. Now, onto the bar! It was a dense and chewy bar, that at first wasn’t that fruity tasting, but as I kept chewing, the sweet fruit flavors emerged. I can certainly taste blueberry, which I liked, which was mildly sweet and quite good. There was a bit of an aftertaste that I couldn’t quite put my finger on what it was- it almost reminded me of a combination of a fig and flaxseed taste. I didn’t really like that part, but it wasn’t bad overall. I did like the little crunchy pieces that gave it some texture. Overall, this gets 3 stars. I can’t say it really reminded me of a blueberry muffin. When I think of muffins, I think sweet, airy, fluffy and buttery. This was more like a blueberry fruit bar with crunchy pieces of nuts and such. I do like that it was organic, had 6 grams of fiber per serving, and was vegan as well! What’s your favorite muffin flavor? If you’d like to answer, please leave a comment below 🙂 ! I’m a fan of banana muffins, and double chocolate chip muffins. Yum! 1 bar is 180 calories, 4.5 grams of fat, 32 grams of carbohydrates, 6 grams of fiber, 14 grams of sugar, and 3 grams of protein. I know when the 4 new flavors of LARAbars came out I was excited. LARAbar generously sent me the 4 new flavors to try, and I couldn’t have been more excited. I mean flavors like Chocolate Chip Cookie Dough? (which certainly was a hit for me!) Which brings me to today’s review, the Carrot Cake LARAbar, which was equally as delicious, and quite enjoyable. Hunger struck the other day, and I wanted something sweet, satisfying, and yet on the go. I opened up the LARA bar Carrot Cake bar, which had an orange wrapper, followed by an orangey colored bar on the inside. Like most LARAbars, this one was made with fruit and nuts, and was a bit calorically dense. However, I didn’t mind eating 200 calories in a small bar, for the flavor was delicious, and the nutrition facts were quite good as well. And, as an added benefit, this bar counted as ½ serving of fruit! Onto the taste- while I can’t say it reminded me of an uber sweet carrot cake with cream cheese frosting- it was rather sweet and really enjoyable. There certainly was a carrot flavor, but a sweet carrot flavor. It was chewy, dense, and very moist. I couldn’t get over this sort of spice it had to it. What WAS that?, I thought as I chewed on this bar. I guessed it was cinnamon, and after looking at the ingredients, I confirmed that indeed, it was cinnamon. Overall, this bar gets 4 1/2 stars from me. Yes, it’s 200 calories for a rather small bar, but the flavor is quite intense and very good, so it’s well worth th 200 calories. Plus I feel good eating this bar, I know that those 200 calories are from heart healthy fats and natural sugars from fruit, rather than added chemicals or other artificial ingredients. Bravo, LARAbar! 1 bar is 200 calories, 8 grams of fat, 2 grams of saturated fat, 32 grams of carbohydrates, 24 grams of sugar, 5 grams of fiber and 3 grams of protein. Dates, Almonds, Walnuts, Raisins, Pineapple, Unsweetened Coconut, Carrots, Cinnamon, Extra Virgin Coconut Oil. Nature’s Path is one of my favorite brands when it comes to organic food. I have yet to this day had a product from this brand that I haven’t liked. 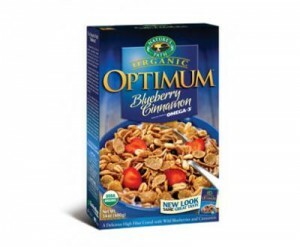 To add to my list of favorites, is the Optimum Blueberry Cinnamon Cereal that I was sent to try from Nature’s Path. So what’s so special about this cereal? Well there’s a few things I like. One- a serving size is ONE CUP! WOO HOO! Two- There’s only 9 grams of sugar in 1 cup of cereal! Okay, so all that’s great, right? But, how does it taste? 1 cup is 200 calories, 3 grams of fat, 38 grams of carbohydrates, 7 grams of fiber, 9 grams of sugar and 9 grams of protein.